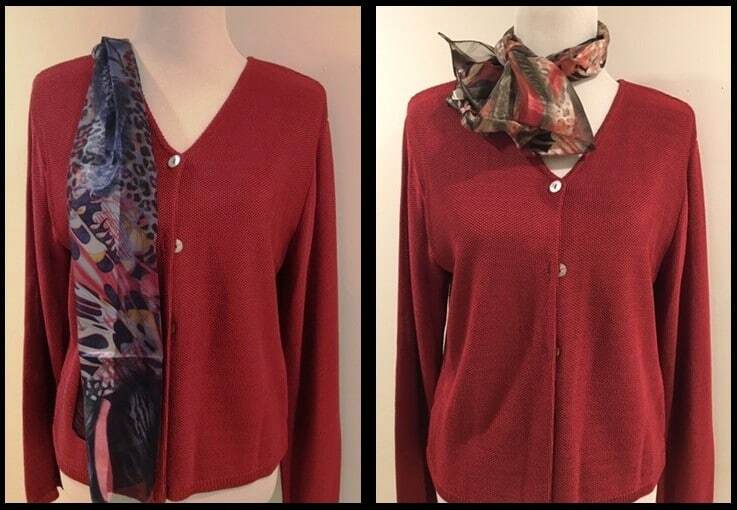 It works with navy skirts and pants or dark-wash jeans, with this linking scarf to polish the combinations. And it will work with chocolate brown skirts and pants and the second scarf. It also works with black or charcoal gray skirts bottoms. 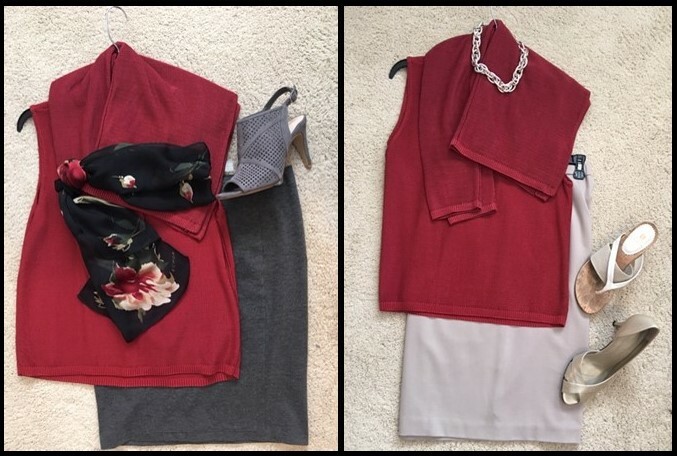 And because the knit is made from absorbent, breathable rayon, I can carry it into summer weather with my pale taupe ponte skirt and a chunky gold/silver mix necklace – taking the look dressier or more casual just by changing up the footwear. That’s 10 combinations so far, not counting the shoe-change trick. But wait … there’s more! Because it is a “2-fer” (two pieces in the same color) I can also split the set and wear the cardigan over color columns in any or those neutrals — navy pant and shell for instance. That’s 10 more combos. Or reverse the mixes and use the shell alone with a neutral bottom and over-layer. I only get 9 combos there because I don’t own a light-taupe over-layer. Now 29 outfits is an awesome total, right? You may want to stop right now and go check out “red” combos in your own closet. Then please report back – What great new outfits did you find? If I expect to get 3 new outfit options for a purchase, this one gave me nearly 10 times that versatility. So I could have paid $120 and still considered it a bargain — $4.14 per outfit. And if I only wear each combo 3 times, my cost-per-wear is an astonishing $1.38. Whether you sew or shop to get new clothes, keep your focus in the right place. It’s not what you pay that matters. It’s what you get for those dollars that makes something a good buy.